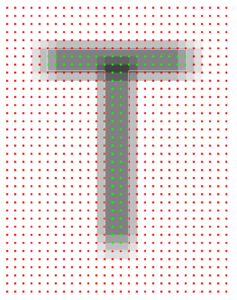 This is part two in the series on 16x AA font rendering using coverage masks, as used in our profiler. In part one, we saw how to render glyphs in real-time using 16xAA, sampled at a regular grid. In this part (part two), we will see how we can move to a rotated grid and how to optimize the shader so that it collapses almost entirely into a texture read and a few table lookups. In part three, we will see how we can rasterize the glyphs in real-time on Compute and CPU. 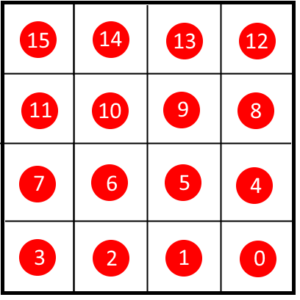 There are 16 evenly spaced samples both in the horizontal and vertical direction. 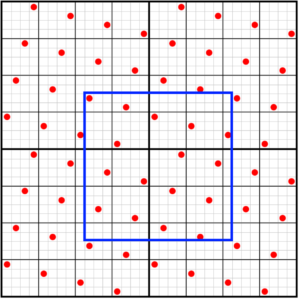 Compared to the regular grid, the samples are moved horizontally and vertically but never leave their cell from the original 4×4 grid. We can use this horizontal skew and vertical skew to adjust our masking. In this animation we see a blue pixel window moving to the right. 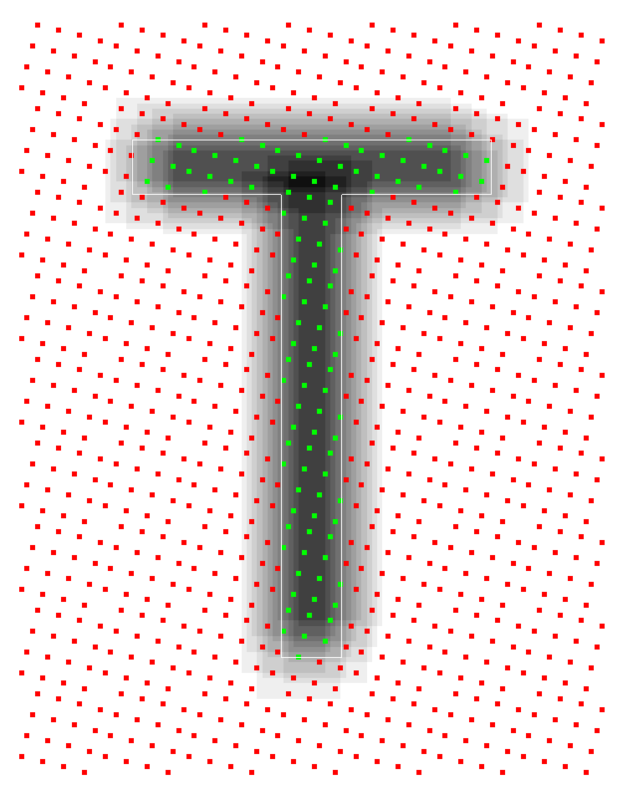 The weights for the top and bottom texels are skewed as explained – this is indicated by the red and green areas. 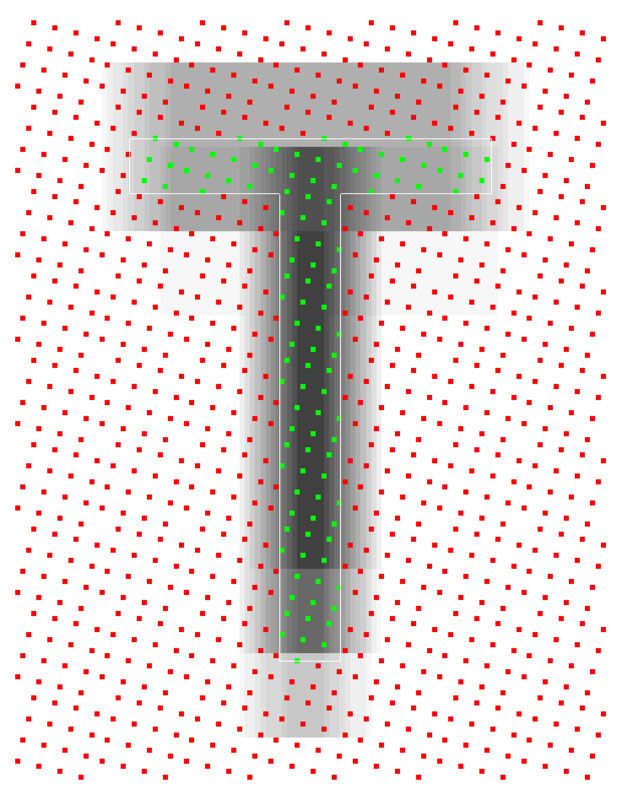 The green area indicates the area where bits need to be enabled, and the red area indicates where bits need to be zeroed out. You can see that for a glyph with straight edges, the samples pop on and off much more frequently, which is why we see more shades. Using the shifts for each row, we can calculate the pixel mask, again separating the 0xF0 pixel mask for the left and right texels. If you recall from part one, the rounding in the shift calculation is required to move the mask only when it crosses sample positions. This rounding will also cause the negative value to snap to zero if smaller than ½, which is the case for our most negative value (-3/8). As the value approaches zero, the value will only get smaller, so between -1.5 and 0, the rounded value remains zero and will never be negative. You can already see how we now have 16 different shades in the horizontal direction. It may not be that apparent, but some of the choices we made in the first part of this series allowed us to do this simple vertical shift. It’s the combining of the left texels and the right texels that allow us to view the 32-bit value as a sorted list, and it’s the row-major ordering of our storage as well. A less obvious factor is the way we’re clearing bits. By using a pixel mask, we only zero out bits outside the pixel window. As a result, the coverage bits never move in position. Alternatively, we could have tried to shift the coverage mask directly, but that could alter their vertical position during the shifting for rotated grids, causing the vertical sorting to break. So far we have taken a pixel window position (a weight) and calculated a horizontal and vertical mask out of it and then we used that mask to zero bits out. Because there is a finite amount of unique mask values, we can precalculate them and put them in a lookup table. 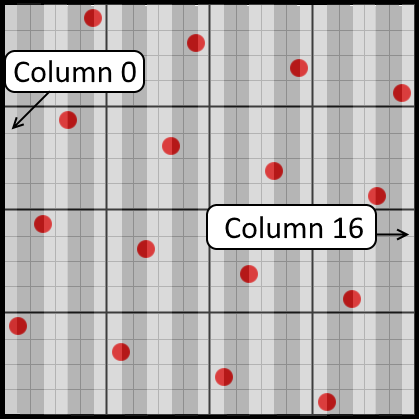 In this image, the gray columns indicate the different mask values. Notice that the mask changes value at the center of a sample. So, the very first and last column have a width of 1/32th of a texel, and the other columns have a width of 1/16th of a texel. Although the rotated grid gives you 16 shades in the horizontal and vertical direction, we have 17 distinct mask values in both the horizontal and vertical direction. 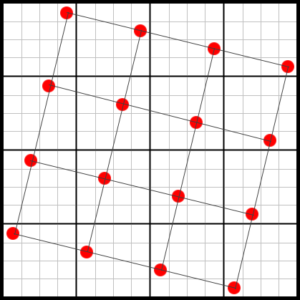 The easiest mapping from weight to mask is to divide the texel into a 32×32 grid. In this table you can see how the first and last entry are unique, and that the other values are duplicated side by side, forming 17 distinct values. It is of course possible to combine the horizontal and vertical masks as well, eliminating the AND that is required for the vertical mask. That would mean that the two horizontal tables would consist out of 32×32=1024 values. However, the separated masks are quite compact and somewhat ‘readable’: you can see the bit shifting pattern in them and how they consist of these 17 distinct values in both directions. For these reasons I personally prefer the compact tables instead. This concludes the rendering part. Next time we’ll see how we actually rasterize and generate those glyphs. See you next time! Follow us on twitter @SuperluminalSft. Great write-up, very clear, some smart stuff here. One thing that concerns me is that the rotated sample grid seems like it will play poorly with italics and other sloped shapes. (You could reverse the rotation to improve italics, but then backslash in some fonts will be bad.) Since you’re already using a mask table, maybe instead of a rotated grid you should use a semi-random grid. 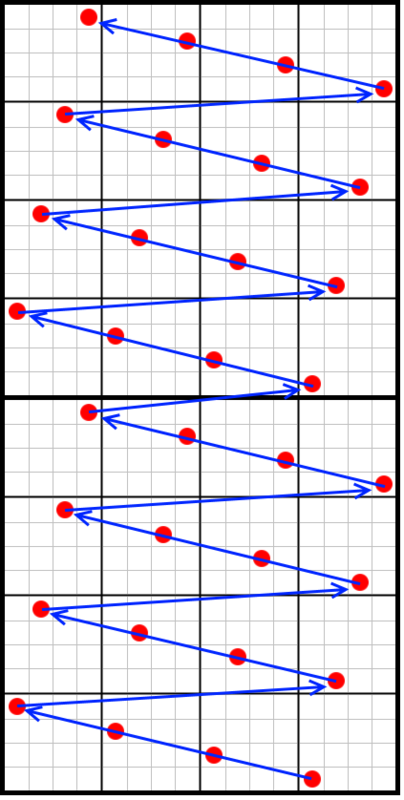 To maintain the current performance, given that you’re using precomputed tables anyway, just have 16 sub-sample rows, each with one sample somewhere on it, but instead of computing with a skew, just precompute a pseudo-random horizontal position for each row, or possibly even use the bit-reversed row index since that may maximize spread. (I.e. 0,8,4,12, etc.–a bit like classical dither.) Actually the first and last sample of that will be too close to each other across the wrapped border, so you probably need to find something smarter but blue-noisish. Could even just jitter your existing rotated positions. Thanks for your comment! The rotated grid has the downside that even though rotated, straight lines could still align with the grid, causing fewer shades than we’d like. 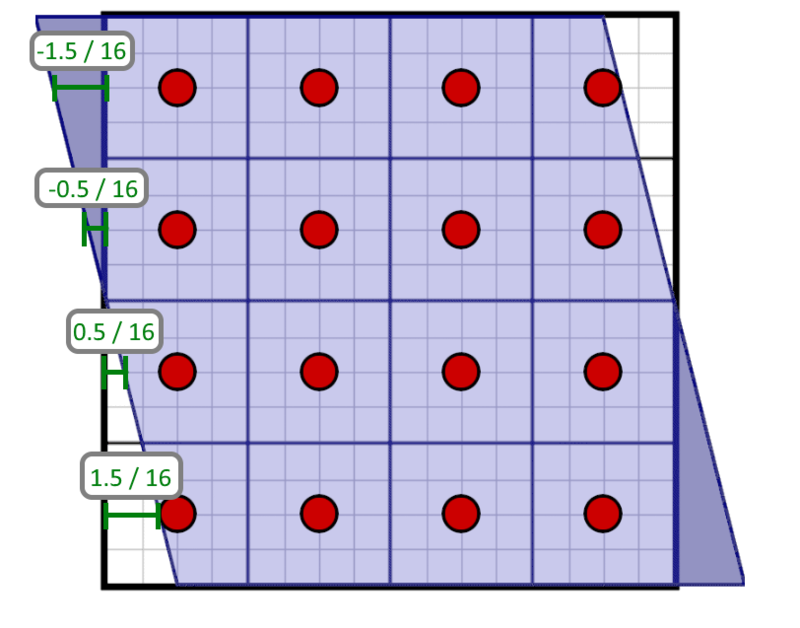 If I read your comment correctly, you’re suggesting to add a bit of noise to the samples to avoid that any straight line could ever align with the grid, is that correct?